Struan Mitchell in possession for Gala YM (picture by Alwyn Johnston). 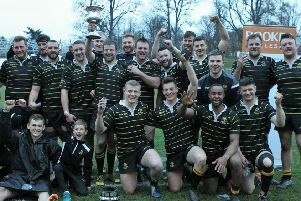 In Saturday’s Border derby in Tennent’s East Region Division 2, Hawick Linden overcame Gala YM with a hard-earned victory built on a massive defensive display. The Linden opened the scoring after two minutes. Gala YM were penalised and the Linden kicked to the corner, with James Rowley securing the ball from the lineout and Graham Colville driving over for a copybook try. The visitors continued to press the Gala line and increased their lead when Kris Rowley kicked a penalty after a Gala YM high tackle. The Netherdale hosts surged into the Linden half from the restart but lost the ball in the tackle. Kris Rowley chipped the ball over the YM defence and it bounced up into the arms of Craig Glendinning, who sped in from halfway to score a try at the posts which Kieran Murphy easily converted. It was 15-0 to the Linden after 12 minutes and the large travelling support was predicting a big win. However, Gala YM had other ideas and their big pack started to turn the screw, with most of the half played deep in Linden territory. The Linden defence held strong but, right on half time, the YM scored a well-deserved try, which was converted, to end the half 15 - 7 to the Linden. Hawick started the second half in determined fashion. After several surges by the forwards, the ball was moved to Aaron Hume, who burst through from 30 yards and, after a couple of hand-offs, he crashed over for a great try. Kieran Murphy converted to increase the lead to 22 - 7. Gala YM were still causing Linden problems and were camped for long periods in the Linden half. The rucks and mauls were becoming a free for all with both teams being penalised, spoiling the flow of the game. Graham Colville received a yellow card in 60 minutes after a difference of opinion with the referee, while it was Gala YM who next felt the offical’s wrath when their centre Jack Easson was red-carded for back chat. With time running out, the Linden went on a last attack and, after several bursts by the forwards, the ball was moved sweetly along the line to winger Ryan Renwick to touch down in the corner for the bonus point win. Hawick Linden next face Earlston on Friday night at the Volunteer Park, while on Saturday, Gala YM are at home to Penicuik.